With ExportHelp Asia service, you will be enthusiastically consulted to choose domain names, website templates, and the way to display information on the website so as to be most suitable for the purpose and your business industry. Implementation process takes place punctually with professional design team who regularly updates the progress to customers to avoid errors in the design process. In particular, during designing, we are always updating new technologies, advising customers to bring the most complete final product. After transferring website to you, ExportHelp Asia has a warranty of 3 months. During the warranty period, if there are errors or technical errors occurring due to our system, Export Help will support to edit your website until it operates stably and can even set new design when it is necessary. Therefore, you can set your mind at rest when using our services. ExportHelp Asia always dedicatedly supports you before, during and after completion of the website design. Our design team is professional, veteran and dedicated to customers. Time for ExportHelp Asia to complete website design is 4 weeks. 1st week: The customer provides pictures (products, office,...) and information (company, project news, product news, typical customer....) for ExportHelp Asia. 2nd week: Export Help updates these information on the website. Note: Depending on the requirements and cooperation from customers that implementation progress can be shortened. 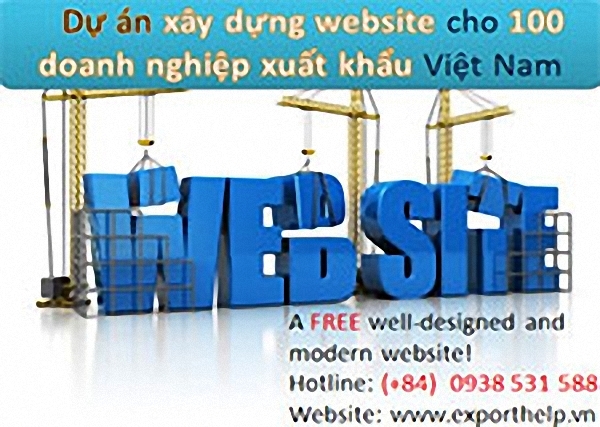 Besides website consulting and design services, ExportHelp Asia also provides other support services such as Website Management, email newsletters, SEO, email marketing, Google AdWords in case customers want to improve the efficiency of use and exploitation for website in order to access to more potential customers. ExportHelp Asia is proud of being one of the companies with the experience and professionalism in the website design field. We hope to be a trusted partner to help your business compete more strongly in this recent Internet development era.